Two pieces of news. 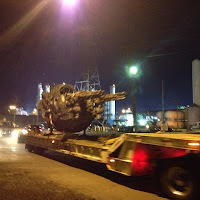 While we thought that Transformers 4 production would start at the Detroit China set on Monday that seems to be incorrect. As previously posted pics and video indicated, the set is still be dressed for filming. However, thanks to Jerry B, we might have a potential schedule based on a Paramount letter he had read sent to local residents around the set. According to the letter the current schedule is July 31 to August 4 and August 7 to 8 with additional filming at the Rosa Parks Transit Center on August 4. 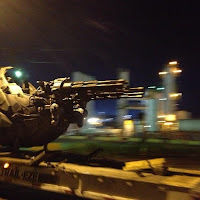 In addition, Shockya has posted these two images of a craft with single person cockpit that looks similar in design to the Transformers: Dark of the Moon ship. I assume the pictures were taken in Detroit. If the prop that big was built for Transformers 4, it means the human characters will be physically interacting in it some way. My theory is this is a human designed craft based on Decepticon technology that was left all over Chicago at the end of the last movie. To make it more of a threat in the story, it is probably specifically designed to destroy Transformer threats. Thanks to Martinus Prime for the link. It looks like the weapon in the Ark, just before it got hit by the missiles in Cybertron in DOTM. To be more specific, it was at the start of the movie when Optimus Prime was narrating it and we are shown a Autobot shooting from the back of the Ark to destroy the Decepticon ships. My theory is, the Ark is brought to earth or something, meaning Omega Supreme could be in it! Just a thought! That's also my observation at first, bc of the round shell, but this is far too small for that. The weapon on the Ark was housing Transformers, for that it needs to be much bigger. So I think it is a weapon created buy human scientists. That they created this from Transformers(Decepticon) technology/aircrafts that crashed and were left from the Chicago showdown. Yeah,that was my second theory as well.Do you think Omega Supreme might be in this? My first guess, he is not in TF4. When I saw the trailer for Dark Of The Moon, I thought the Xanthium was Omega Supreme, it should have been Omega Supreme. It's main purpose is to transport the Autobots, instead if fighting. But I don't think he will be in TF4, bc such a big robot would almost be invincible too, for normal Decepticons and humans to fight. I think he's just to big of a robot, he's much bigger than a combiner. But we'll see. It's almost a given, that Unicron makes a small appearance to revive Megatron as Galvatron. But then again, maybe the human scientistst revive Megatron, with the technology found in Chicago. These pics came from the set in River Rouge where the Boblo boats were being blown up. Please post in English so everyone could read what you are saying. What good is it for you to post these crap on this site where no one gives a hoot about anything else but Transformers. Hover over the links and you'll see it's a retarded spammer. No idea why Google allows spammers to post tons of links in a single comment, though. You would think they could figure out how to block that. There is an interview on www.comicbookmovie.com from MTV News with Mark Wahlberg, on his film "2 Guns", where he is asked about the Dinobots rumor. It's a funny interview, but the one interesting thing I heard, that is important, is that Wahlberg said, his character is an "inventor". So not just a simple mechanic, as we at first thought he would be. "single dad, trying to succeed as a inventor, with very little means"